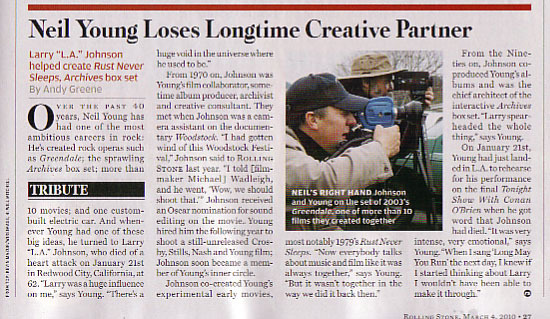 There is a tribute to Larry "L.A." Johnson in the most recent issue of Rolling Stone Magazine. "L.A." passed away last month leaving a huge void in the Shakey Pictures team while creating a lasting legacy to Neil Young fans with his definitive film director work on Rust Never Sleeps, amongst many other works over the past 40 years. "Larry was a huge influence on me," says Young. "There's a huge void in the universe where he used to be." 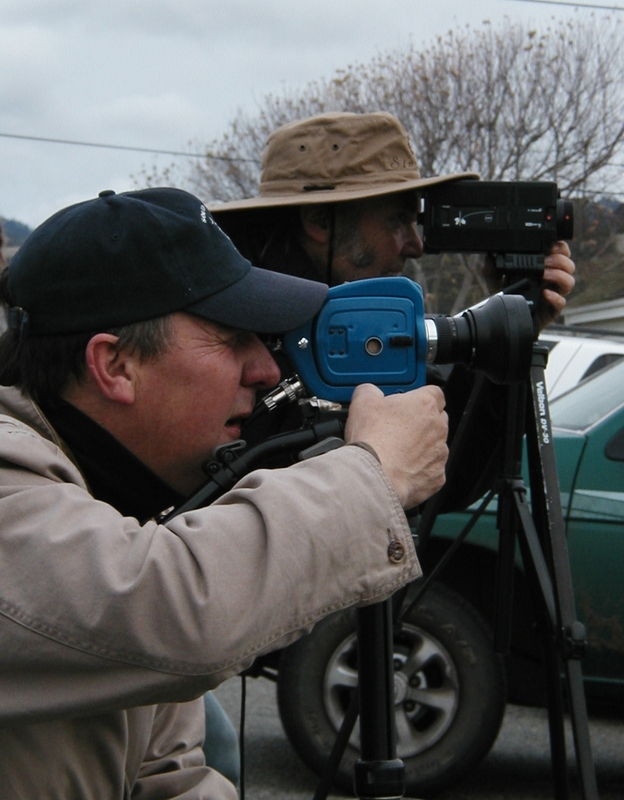 Johnson co-created Young's experimental early movies, most notably Rust Never Sleeps. "Now everybody talks about music and film like it was always together," says Young. "But it wasn't together in the way we did it back then." From the Nineties on, Johnson co-produced Young's albums and was the chief architect of the interactive Archives box set. "Larry spearheaded the whole thing," says Young. On January 21st, Young had just landed in L.A. to rehearse for his performance on the final Tonight Show With Conan O'Brien when he got word that Johnson had died. "It was very intense, very emotional," Young. "When I sang `Long May You Run' the next day, I knew if I started thinking about Larry I wouldn't have been able to make it through. Also, see Larry "L.A." Johnson: 1947 - 2010 which has many warm, fond memories of L.A. in the comments section. Ya know, you could see the emotion in Neil's face when he was singing especially on the lower notes. I was amazed he managed to finish the song under the circumstances. He was definitely singing to one man that night. Nice that RS recognized LA. Also nice that Jeff Beck & Eric Clapton are on cover. I picked up the issue cause of the cover so it was a nice touch. Wish more RS covers were this great. Also, the Musicares tribute on next page. What's up with that photo caption??? "Neil Young with girlfriend Elton John." C,mon. typo or some goof..
Nice tribute to `L.A.` by RS. Very nice story in The Stone: sweet, sad and too short (kind of like life). Also really informative: what if L.A. hadn't told Michael Wadleigh about Woodstock? Would the other group have been the ones to make the movie? What would that have been like, and what would have been different (probably everything). I can almost picture Neil going through LAX, getting the terrible news and having that realization we've all had. And then he went ahead like he always does. Best issue of RS in a long, long time. Clapton & Beck cover story; Johnny's last album; Dylan goes to Washington; Rob Sheffield on Lost ("you'll never see a network show this insane again"); Neil, Pegi and Elton; Ryan Bingham; Shaun White. And Matt Taibbi writes an insanely good article while totally sticking it to Goldman Sachs (full disclosure: I know Matt and his people...great guy, wonderful family). Can't imagine a world w/out Woodstock, Last Waltz, Rust Never Sleeps, Greendale, Archives and many of LA's masterworks. As I'm writing this, there's a silent tribute on TV for the brave soldiers we recently lost in Afghanistan...and I'm thinking of them and also the picture I saw of Larry and his boy, both of them wearing Army T shirts...my dad was WWII Army and he sure would have loved that photo! I think that the Neil writing on the new BD is dated 21 january.